These Booking Conditions and the Further Information contained on this website form the basis of your contract with Ionian Island Holidays Ltd also trading as Aegean Island Holidays. Please read them carefully as they set out our respective rights and obligations. These booking conditions have been formulated as a result of our responsibilities under law. They do not affect your statutory rights. 1) What happens when you make a reservation? All bookings are made and accepted subject to the terms set out in these conditions and the information detailed in this supplement. When you or your travel agent make the booking a contract is made, and we will confirm your booking as soon as we receive your instructions verbally, electronically or in writing. You must then pay the deposit together with any applicable insurance premium. Special requests can be made but cannot always be guaranteed. An invoice will be sent to you, or your travel agent, for the balance of monies owing. If intended departure is within 8 weeks, then the total holiday cost, including the insurance premium, is payable in full at the time of booking. The price of your holiday was calculated using exchange rates quoted in the Financial Times Guide to World Currencies on 2 October 2018. in relation to the following currencies £1 sterling being €1.12 Changes in transportation costs, including the cost of fuel, duties, taxes or fees chargeable for services such as landing taxes or embarkation or disembarkation fees at ports and airports and exchange rates, mean that the price of your travel arrangements may change after you have booked. However, there will be no charge within 20 days of your departure. We will absorb, and you will not be charged for any increase equivalent to 2% of the price of your travel arrangements, which excludes insurance premiums and any amendment charges. You will be charged for the amount over and above that, plus an administration charge of £1.00 per person together with an amount to cover agents’ commission. If this means that you have to pay an increase of more than 8% of the price of your travel arrangements, you will have the option of accepting a change to another holiday if we are able to offer one (if this is of equivalent or higher quality you will not have to pay more but if it is of lower quality you will be refunded the difference in price), or cancelling and receiving a full refund of all monies paid, except for any amendment charges. We will consider an appropriate refund of insurance premiums paid if you can show that you are unable to transfer or reuse your policy. Should you decide to cancel for this reason, you must exercise your right to do so within 14 days from the issue date printed on your final invoice. Should the price of your holiday go down due to the changes mentioned above, by more than 2% of the holiday cost, then any refund due will be paid to you. Please note that travel arrangements are not always purchased in local currency and some apparent changes have no impact on the price of your travel due to contractual and other protection in place. 3) How to book, what to pay and when? The person, in whose name the booking is made, acts on behalf of all other persons named, must be over 18 years of age and becomes responsible to us for all payments in respect of the booking. Your reservation will be confirmed upon payment of a deposit of £150 per person (for our standard holidays) plus any applicable insurance premium. For certain holidays where flights are separately bought in and cannot be cancelled, the full cost of the flight will be payable at the time of booking, as well as an additional charge relating to the accommodation and other services provided. In the event that the accommodation is also non-refundable, full payment will be required at the time of booking. It is a condition of booking that you are adequately insured on your holiday. We allow 5 working days from confirmation of the booking for monies to reach us. If after that period monies have not been received, the holiday is cancelled, and cancellation charges will apply. We must receive the balance of the holiday cost at least 8 weeks before the departure date. Please also ensure you send payment in sufficient time for us to pay in and clear it through your bank, otherwise your booking will be cancelled, and you will be liable to pay cancellation charges as shown in Condition 18. If your holiday is arranged through our authorised travel agents and not directly with us, then all monies paid to your Travel Agent are held by them as an Agent of Ionian & Aegean Island Holidays. Late Bookings: For all bookings made within 8 weeks of departure, the holiday is confirmed as soon as you or your Travel Agent gives verbally over the telephone, or by e-mail confirmation. Therefore, if you subsequently cancel your booking, cancellation charges as shown in Condition 18 apply. Full payment for the holiday, including insurance premiums, must be made at the time of booking in order to secure the reservation. Please check your invoice carefully to ensure that it reflects your intended booking. 4) What do we charge for children, toddlers and babies? The conditions below apply to all children travelling with Ionian & Aegean Island Holidays Limited. Definitions: an ‘infant’ is a child under the age of 2 on the return of such child to the UK. A ‘child’ is a person aged between 2 and 15 on the return of such child to the UK. Handling Agents at airports will specifically check the child’s date of birth with passport entries. Price reductions for children are listed in our printed brochure and apply to children sharing with two full fare paying adults. The adult price is based on the number of adults and children sharing the accommodation. Infants travel for £50 – cots, highchairs and baby seats are provided free of charge, if requested at the time of booking. Passengers booking places for infants, where the infant is found to be outside the age limits specified above, will be required to pay the full price plus an amendment fee, before any member of the party will be allowed to board the aircraft. Any child booked as an infant who is, in fact, over the age of two on the date of RETURN travel, will be refused permission to board if there are insufficient seats on the aircraft, as airline regulations stipulate that children over two must have their own seats. Infants are not included in car passenger numbers where car hire is included. Please ensure that the vehicle that is included to accommodate your infant(s) is suitable otherwise please ensure that you upgrade to a suitable vehicle. 5) What happens if we change your holiday? We plan our holidays many months in advance and although it is unlikely that we will have to make any changes to confirmed bookings, it can happen. Changes are usually of a minor nature, and we will advise you or your travel agent at the earliest possible date, if there is time, before your departure. Flight timings and carriers in this brochure are subject to change, confirmed details will be sent with your tickets. Ionian & Aegean Island Holidays reserves the right to alter the brochure flight departure time to a different time within a period of twelve hours of the notified time of departure, without responsibility for any loss or damage arising from such a change. Airport authorities or other factors beyond our control may vary the scheduling of departure times after this brochure is printed and the details given are for your guidance only. We are unable to accept any liability for any delay to your flight, whether the delay or cancellation is caused by adverse weather conditions, the action of air traffic controllers, the action of airport authorities or governments, the rescheduling of times by the airline, mechanical breakdown, strike or industrial action or otherwise. In such circumstances you may be able to make a claim under your insurance policy. We reserve the right to alter the aircraft type or airline operating your flight, this is not a major change, and we will be under no obligation to notify you of any such change. If a major change occurs, provided it does not arise from events beyond our control, you will have the choice of (a) accepting the changed arrangements, (b) purchasing another available holiday from us, or (c) cancelling or accepting the cancellation and receiving a full refund of all monies paid to us. In all cases we will pay compensation on the scale shown. A ‘major change’ is any of the following made before the day of departure: change of departure airport, holiday area, change of flight departure time by 12 hours or more, substitution of accommodation originally booked with one of a lower price or official grading. If you wish, we will give you a credit voucher against a future Ionian & Aegean Island Holiday instead of cash. *NB: For children invoiced at reduced rates, compensation will be paid on a pro-rata basis. Compensation payments apply to all holidays booked including reduced price or special offer holidays. However, in the case of reduced price or special offer holidays, compensation is 50% of the above rate. They do not apply to changes caused as a result of force majeure and circumstances beyond our control (Condition 7). 6) What happens if we are forced to cancel your holiday? We reserve the right, in any circumstance, to cancel your holiday. However, in no case will we cancel your holiday less than 8 weeks before the scheduled departure date, except for the reasons detailed in Conditions 2, 7 and 11. If due to events beyond our control, we can no longer provide the holiday originally booked, we will return your money, or offer you an alternative holiday of a comparable standard. Except where we say differently elsewhere in these conditions, we cannot pay any compensation, reimburse expenses, or cover losses for any amount or otherwise accept responsibility if, as a result of circumstances beyond our control, we have to change your holiday after booking, or we, or our suppliers, cannot supply your holiday, as we, or they, had agreed, or you suffer any loss or damage of any description. When we refer to circumstances beyond our control, we mean any event that we, or the supplier in question, could not foresee or avoid, even after taking all reasonable care. Such circumstances will usually include, but are not limited to, war, threat of war, airport closures, epidemic, natural or nuclear disaster, terrorist activity, civil unrest, industrial dispute, bad weather (actual or threatened), change to Foreign Office advice to advise against travel to destination and significant building work ongoing outside of your accommodation. 8) What are Ionian & Aegean Island Holidays liable for? We will accept responsibility for the arrangements we agree to provide or arrange for you as an ‘organiser’ under the Package Travel and Linked Travel Arrangements 2018. Subject to these booking conditions, if we or our suppliers negligently perform or arrange the services which we are obliged to provide for you under our contract with you, as set out on your confirmation invoice, we will pay you reasonable compensation. The level of such compensation will be calculated taking into consideration all relevant factors such as but not limited to: following the complaints procedure as described in these conditions and the extent to which ours or our employees’ or suppliers’ negligence affected the overall enjoyment of your holiday. Please note that it is your responsibility to show that we or our supplier(s) have been negligent if you wish to make a claim against us. Loss of and/or damage to any luggage or personal possessions and money; the maximum amount we will have to pay you in respect of these claims is an amount equivalent to the excess on your insurance policy which applies to this type of loss per person in total because you are assumed to have adequate insurance in place to cover any loss of this kind. Claims not falling under (a) above and which don’t involve injury, illness or death The maximum amount we will have to pay you in respect of these claims is twice the price paid by or on behalf of the person(s) affected in total. This maximum amount will only be payable where everything has gone wrong and you or your party has not received any benefit at all from your booking. Where any payment is made, the person(s) receiving it (and their parent or guardian if under 18 years) must also assign to ourselves or our insurers any rights they may have to pursue any third party and must provide ourselves and our insurers with all assistance we may require. We will not accept responsibility for services or facilities which do not form part of our agreement or where they are not advertised in our brochure or website. This section covers injury, illness or death while you are using the holiday services that we have arranged for you, including our accommodation. We have no direct control over the way our suppliers provide their services but everyone employed or contracted by us or by our suppliers is expected to carry out their duties properly. If they do not carry out their duties properly (or at all) and that fault results in your injury, illness or death, we may make a payment to you. We will not make any payment if your injury, illness or death was caused by an event or circumstances which the person who caused it could not have predicted or avoided even if they had taken all necessary and due care. We will not make any payment if your illness, injury or death was your own fault. If we do make a payment, it will be similar to one you would receive under English law in an English court. You must tell us and the supplier involved about your injury or illness while you are in the resort (see Condition 23). You should also write to our Customer Services at the address given in Condition 23 about your claim within 28 days of coming home from your holiday to allow us to investigate it properly. Please include a letter about your injury or illness from your doctor if you can. You should transfer to us any rights you have against the supplier or any other person. You should co-operate fully with us if we or our insurers want to enforce those rights. Any payments we make may be limited in accordance with international conventions. We ask you to transfer your rights to us so that we can claim back from suppliers any payments we make to you, plus any legal or other costs. We will not make a profit from this. If we get back from the supplier more than we have paid you, we will refund you the difference. We reserve the right to refuse to accept you as a customer or continue dealing with you if your behaviour is disruptive, affects other travellers, is threatening or abusive towards our staff, agents in the UK, in resort, on the telephone, in writing or in person. If the Captain of your flight or any of our resort staff believes that you could be disruptive, they can also refuse to permit you to proceed with your travel arrangements. If this means you are not allowed to board the flight outbound from the UK, we will treat your booking as cancelled by you from that moment, and you will have to pay full cancellation charges (see Condition 18). If this occurs overseas then you will become responsible for your own return home and any other members of your group who cannot or will not travel without you. In any of these circumstances no refunds or compensation will be paid to you and we may make a claim against you for any costs and expenses incurred as a result of your behaviour e.g. the cost of diverting an aircraft or boat to remove you. Criminal proceedings may also be instigated. In the very rare event of over-booking accommodation of which we are not aware before you depart, you will be offered alternative accommodation on arrival, which accommodation will be of a comparable standard if available. If the location and/or facilities of the alternative accommodation can reasonably not be considered similar to that originally booked, we will compensate you by paying you the difference in price, if any, between the two properties plus compensation of up to 5% of the original holiday price. We make every effort to ensure that all resorts and accommodation offered in this brochure or website are described as accurately as possible and that all price indications are correct. Changes, however, can occur and we reserve the right to make changes, in which case you will be informed, of any price change and any material descriptive change, at the time of booking or on your subsequent Holiday Confirmation Invoice. You should bear in mind that certain facilities, particularly sports, entertainment and excursions, are subject to demand at any given time. It would not, for instance, be reasonable to expect an excursion to run unless there is demand which makes its operation economically viable. If a hotel is equipped with centrally controlled air-conditioning, the period and time of functioning of the system is at the discretion of the hotel management. Accommodation which forms part of your booking may only be used by the persons named on the booking form. Subletting is not permitted (see Condition 16). You must observe the rules, if any, relating to the accommodation. You must vacate the accommodation in most areas by 10 am on the day of departure. There may be some exceptions, and these will be advised locally by our representative, agent or accommodation provider. Check-in is normally available from 4pm onwards subject to hotel/accommodation management discretion. If an accommodation has internet access this is usually mentioned in the description. In most cases connections are sufficient for checking emails and light web browsing. Bandwidth restrictions may apply if the connections are used for downloading large files or streaming video content. WiFi is available in most villages and many local cafés also advertise free connections. Please note we cannot guarantee WiFi availability as this is dependent on local ISPs, technical issues etc. On selected properties local charges may apply. This facility does not form part of our contract with you. 15) What if you break or damage anything on your holiday? Should a client be responsible for damage to or loss of any item of the accommodation inventory during their occupation of the holiday accommodation, a charge will be made locally to cover the cost of replacement or repair. Please make this known to your Resort Representative prior to your departure. This will enable us to put things right for the new arrivals. Where any breakages have occurred and payment is due our representative will issue an official company receipt specifying details on the amount paid. The number of people stipulated in the confirmation of booking must not be exceeded unless approval is obtained from the Company’s local representative or from the Company’s London Office and the appropriate payment made. Any unauthorised guests found to be staying at the property will be asked to leave. 17) What happens if you change your holiday plans? If you wish to change your holiday in any way, and we can accept the change, the following charges will apply. Timescales refer to the date of receipt of your instructions in writing, and cancellation charges are detailed in Condition 18. More than 56 days before departure – £50 per change. Less than 56 days before departure – Cancellation charges apply. No changes are allowed from a full price holiday to a special offer holiday. No changes are allowed from one season to another. This would be treated as a cancellation. If there is a change in the number of persons booked on the holiday, the price will be recalculated on the basis of the amended party size, subject to availability. If one person in a twin room cancels we reserve the right to pass on the full cost of the twin room to the person using the room. Any increase in price per person as a result of a part cancellation is not a cancellation charge and is not covered by our insurance. A separate cancellation charge as detailed in Condition 18 will be made against the cancelled element, and the booking will be re-invoiced accordingly. Name changes: Names can be changed at £50 per name up to 28 days prior to the departure date (only applicable to our charter flights). N.B. On scheduled flights no name changes can be accepted. 18) And if you cancel? We reserve our right to pass on to you any cancellation charges imposed by our suppliers which are in excess of the cancellation charges set out above. In particular, any "bought-in flight element" (i.e. that you are booked on non-standard Ionian & Aegean Island Holidays flights, scheduled or chartered, for which a higher deposit is required as they formulate part of the terms and conditions of that airline) and/or accommodation (i.e. where full payment is required to obtain a special offer price at the time of booking) will be charged at 100% cancellation fees irrespective of when the cancellation was made. If the deposit paid is more than the percentage cancellation charge applied within 56 days then the higher amount will be applied. Cancellations must be notified in writing to us or your travel agent and commence from date received by Ionian & Aegean Island Holidays. NB: If the reason for cancellation falls within the terms of your insurance policy, then the insurance company will normally refund any such charges to you. The insurance premium is forfeited on cancellation. Please note this if you do not turn up for your flight, unless you inform us otherwise, your booking will be treated as a cancellation and normal cancellation charges of 100% will apply. Beaches, the sea, roads and areas around holiday accommodation do not form part of the package and have not been inspected. You must also pay for any excess on car hire insurance, parking fines and petrol consumed. It is your responsibility to resolve any dispute regarding damage to the vehicle, fuel and parking fines locally and make full payment to our local car hire agent before departure. The Company does not operate its own excursions. Any excursions booked locally at destination do not form part of the package, whether reserved through our local agent or representative. Ionian & Aegean Island holidays acts solely as an agent for any such excursions and takes no responsibility or accepts any liability for their correct performance. Your contract will be with the operator of the excursion or tour and not with us. All boating and sailing facilities are offered subject to availability and are subject to local Greek laws and the directions of the local harbourmaster. The Company cannot be held responsible for loss of boat hire due to adverse weather conditions. You are responsible for any damage caused to your hired motorboat, as these boats only have third party insurance cover. Any dispute regarding boat hire including petrol charges and damage to the boat must be settled locally before your departure. 23) What happens if you complain about your holiday? If a problem arises during your holiday, it is important that you advise the supplier and/ or representative at the earliest opportunity, who will endeavour to put things right. If your complaint cannot be resolved locally, your representative will ask you to complete a Client Liaison form, the original to be kept by you and a copy will be forwarded to our Head Office. This form records your grievance or complaint made whilst in resort. 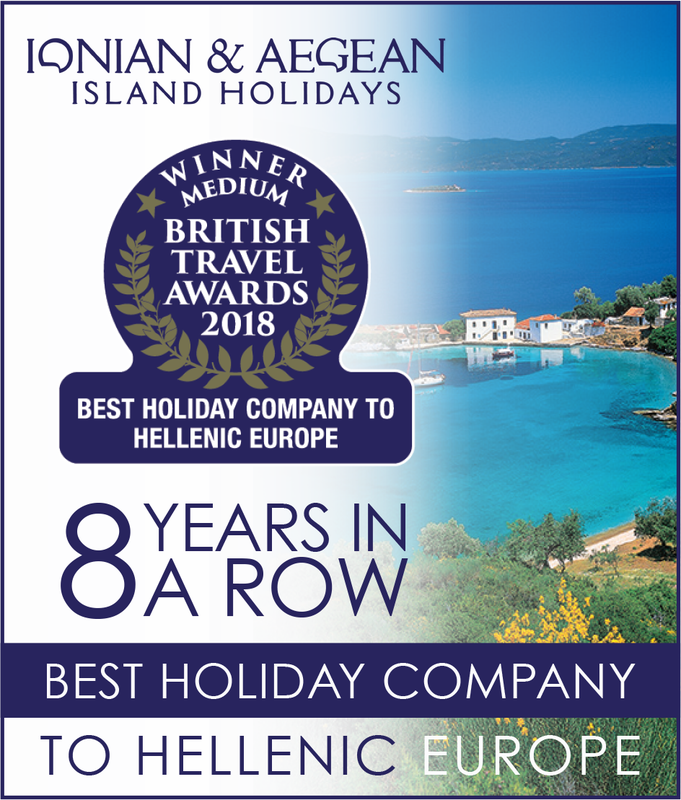 Should you wish to take the matter further, please email our Customer Relations at cr@ionianislandholidays.com or write to Customer Relations, Ionian & Aegean Island Holidays, Olympia House, Armitage Road, London NW11 8RQ, or your travel agent, within 28 days of returning home quoting your booking reference number. Unless there is a valid reason, we will not consider Ionian & Aegean Island Holidays Ltd liable for any complaint that was not initially registered with our representative ‘in-resort’. It is unlikely that you will have a complaint that cannot be settled amicably however should you wish to write to us please allow 28 days from written receipt of correspondence in which to investigate and respond to your grievance. Please include an email address so we may acknowledge receipt of your correspondence. Disputes arising out of, or in connection with, this contract which cannot be amicably settled, may be referred to arbitration, if the client so wishes, under an independent scheme arranged by The Association of British Travel Agents Ltd and administered by the Chartered Institute of Arbitrators. The scheme provides for a simple and inexpensive method of arbitration on documents alone, with restricted liability on the client in respect of costs. Full details will be provided on request or can be obtained from the ABTA Ltd, website (www.abta.com). 24) What happens if you lose or damage a piece of luggage? Under the terms of various international conventions, while your personal effects and baggage are in the hands of the carrier, the carrier is liable for the safety of such baggage. If your baggage is lost or damaged between the time of airport check-in and the recovery of the baggage from the carousel at the end of the flight, then the carrier is under a duty to pay compensation. The amount of compensation is determined by international convention, details of which are on the reverse of your flight tickets. In case of loss or damage, a Property Irregularity Report must be completed before you leave the airport. Should your claim be in excess of the airline’s compensation level, then you should approach your insurers to see if they will pay the difference. It is your responsibility to ensure that all your belongings are loaded onto the correct transfer coach, minibus, taxi or hire car. At all other times when your personal effects and/or baggage are in the custody, care and control of Ionian & Aegean Island Holidays, we will be responsible for the safety of such items. However, we will not accept liability for claims in excess of £400. Items of high individual value should be adequately insured, as neither Ionian & Aegean Island Holidays nor its carriers will accept liability for loss or damage. 25) What rules apply to flights including flight delays? Flight times are provided by airlines and are subject to change owing to matters such as air traffic control restrictions, weather conditions and technical problems. Flight timings are therefore estimates only and cannot be guaranteed. As between you and any individual airlines, the airline’s standard conditions of carriage will apply. These may limit or exclude liability in accordance with relevant international Conventions. Copies of these Conventions are available from us on request. If you or any member of your party misses your flight or other transport arrangement, it is cancelled, or you are subject to a significant delay for any reason, you must contact the airline or other transport supplier concerned immediately. The Package Travel and Linked Travel Arrangements 2018 provide that if you experience difficulty on the occurrence of circumstances described in Condition 2 a,b,c or d and Condition 8 of these booking conditions, we will provide you with prompt assistance. Where you experience a flight delay or cancellation which is not owing to any failure by us, our employees or subcontractors, this assistance is likely to extend to providing help in locating refreshments, accommodation and communications but not paying for them. Under the Denied Boarding Regulation (EU 261/2004), if you have been denied boarding, your flight has been cancelled or it has been significantly delayed, it is the airline’s duty to look after you. This means providing food, drinks, and some communications. If you are delayed overnight, this also means a hotel and travel to and from it. Full details of these rights will be publicised at EU airports and will also be available from airlines. If the airline does not comply with these rules you should complain to the Civil Aviation Authority at www.caa. co.uk/passengerrights. We have no liability to you in these circumstances whatsoever and your claim for this assistance and any compensation must be made directly to the airline. Liability of an airline under EU 261/2004 will not entitle you to a refund of your holiday price from us. We cannot accept liability for any delay which is due to any of the reasons set out in Condition 7 of these booking conditions (which includes the behaviour of any passenger(s) or for any passenger who, for example, fails to check in or board on time). A delay or cancellation to your flight does not automatically entitle you to cancel any other arrangements even where those arrangements have been made in conjunction with your flight. However, you may be entitled to claim under the flight delay section of your travel insurance policy. We have no control over how much leg room (seat pitch) airlines allow on their aircraft. No guarantee can be given as to a specific seat configuration on board as aircraft types vary. However, these seat pitches are standard throughout the airline industry and comply with current Civil Aviation Authority guidelines. This brochure is our responsibility, as your tour operator. It is not issued on behalf of, and does not commit the airlines mentioned herein or any airline whose services are used during your travel arrangements. In order to process you booking and to ensure that your travel arrangements run smoothly and meet your requirements, we need to use the information you provide such as name and address and any special needs/dietary requirements, etc. We take full responsibility for ensuring that proper security measures are in place to protect your information. We must pass the information onto our relevant suppliers of your travel arrangements such as airlines, hotels, transport companies, etc. The information may also be provided to security or credit checking companies, public authorities such as customs and immigration, if required by them, or as required by law. We will not, however, pass any information onto any person not responsible for part of your travel arrangements. This applies to any sensitive information that you give to us such as details of any disabilities, or dietary or religious requirements. If we cannot pass this information to the relevant suppliers, whether in the EEA or not, we cannot provide your booking. In making this booking, you consent to this information being passed onto the relevant suppliers. This contract is made on the terms of these Booking Conditions, which are governed by English law, and both parties shall submit to the jurisdiction of the English courts. Issue date November 2018, errors and omissions excepted.